As always, layout is the bane of my creative existence. Eventually I hope my skill in that area will improve; if not in quality than at least in time spent. But since this is the 40th birthday of D&D I wanted to be sure I made some progress. 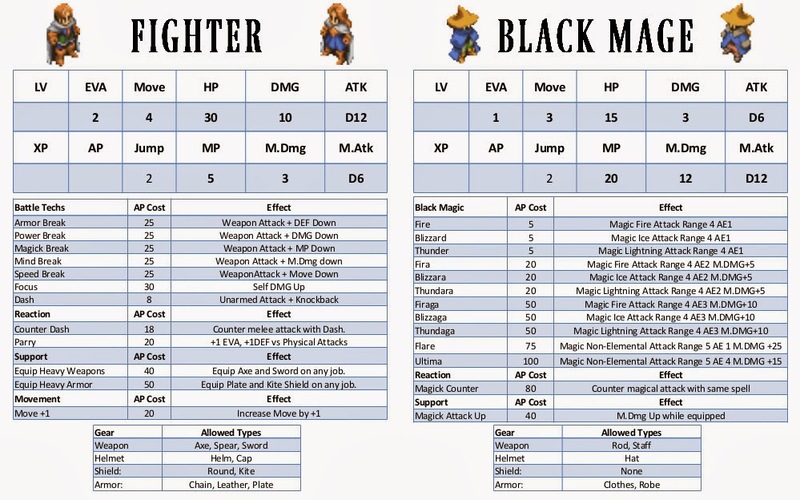 Here's a pic of the job sheets for Fighter and Black Mage complete with fancy, isometric sprites. The top part shows the stats and values for each job as well as containing a space to record LV, XP, and AP. The AP box is handy but the LV and XP boxes are redundant since they are the same for each character regardless of job. I decided to do these two jobs first because they are polar opposites of each other. The Fighter has the highest HP, DMG and ATK stats as well as the lowest values in MP, M.Dmg and M.Atk while the Black Mage is the exact reverse situation. With that said, you may notice that HP and MP are not on the same scale. Everyone gains some of each but HP range from 15-30 and MP from 3-20. DMG and M.Dmg are almost the same scale. Both have a minimum value of 3 but M.Dmg caps at 12 rather than 10. This pic shows the complete list of abilities for each job. The Black Mage has only one option in both the Reaction and Support categories, and no Movement abilities at all. The Fighter, by contrast, has the very useful "Move+1" Movement ability and a choice of two each in Support and Reaction, though neither of their Support abilities are actually useful when Fighter is set as the main job because they are both Equip abilities. If you add up the AP costs you will also see that to Master the Black Mage job it costs 200 more points than the Fighter. AP costs, as of now, are taken directly from the video games and that means that different jobs can cost different amounts to master and that is okay. The specific costs will certainly change in order to achieve better balance, but I am not committing to making the jobs all cost the same. As mentioned above, mastering a Job is easy, all you need to do is buy all of its abilities. As of now, what that does for you is grant permissions to use certain items and unlock additional jobs. I'm considering treating mastery as a bonus level so that when you finally master a job you get all the HP, MP, DMG and M.Dmg of gaining a level while that job is primary. There could be other benefits, such as allowing certain equipment in other jobs, but that can't be too much or it makes the Equip type support abilities redundant. In some cases it could allow a boost when using job abilities, so that your Fighter who has already mastered Black Mage isn't choking on a D6 M.Atk die. But that's a problem for another post.